Know yourself as well as your craft, and be the best in the world for the world. Loma Linda University Health held its 8th annual Women’s Conference Thursday, May 5 at the Riverside Convention Center. Themed “Be the Artist of Your Life,” the event welcomed approximately 1,000 attendees who were treated to a day full of creative and empowering resources to live better. K-FROG’s Heather Froglear not only emceed the event for the eighth year in a row, but she was also a surprise honoree, recognized for her longstanding dedication to giving back to the community. “I was truly touched to be the surprise honoree at the Women’s Conference,” Froglear posted on her Instagram account later in the day. The conference began and ended with keynote presentations that highlighted the conference theme. In the morning, Dewitt Jones, one of America’s top professional photographers, shared insights he learned during the latter part of his college days to the two decades he worked for National Geographic. “Eventually you have to move from imagination to imagine-action,” he said of living one’s dream. “Know yourself as well as your craft,” Jones continued, “and be the best in the world for the world,” he urged as he showed several series of images on large screens — from flowers to sunsets to people. “Pausing, being open to the unexpected can take an assignment from good but ordinary, to magnificent.” An apparent crowd-pleaser, Jones exited the stage after receiving a standing ovation. The conference ended on a powerful message, “The Beauty of Being You,” shared by Jess Weiner during the afternoon keynote. Weiner shared stories of her childhood, watching TV and searching for someone to identify with. Her personal journey led her to create “Talk to Jess,” a company that collaborates with brands to help them understand and better connect with women, girls and families in their audience. Her keynote message inspired attendees to think of themselves with confidence and pride instead of being defined by others. 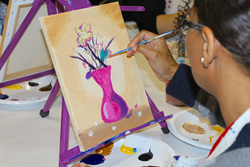 During the day, creativity abounded as women took brushes to canvas, painting landscapes taught by an artist from the Purple Easel. There were booths and exhibits to visit with samples and giveaways, one-on-one-time with experts from dentistry to OB-GYN, self-defense to physical therapy and health testing. There was also time to dine and shop.